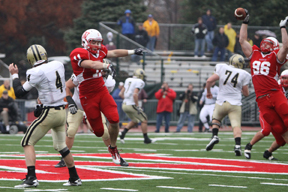 Jim Amidon — While it is not likely to be erased from our memories any time soon, the 117th Monon Bell Classic is behind us and the Wabash College football team’s 47-0 victory over arch rival DePauw put a nice stamp on the fall season at the College. And what a remarkable fall it was. Folks who care deeply about Wabash have plenty to be thankful for as the campus falls quiet for Thanksgiving break. Here are but a handful of reasons why we give thanks this week. In late August, President Pat White rang in 253 new students to Wabash. The freshmen come from across the country and around the world, and have enriched every aspect of our community. We are thankful that in this difficult economy, Dean of Admissions Steve Klein and his dedicated staff — and all who help us recruit students — brought in such a large and wonderful class. About that same time, Wabash was featured in the U.S. News & World Report’s 2011 College Guide, the Princeton Review’s Best 373 Colleges book, and Forbes magazine’s Best Colleges guide. In early September, the College’s glorious new football field was dedicated as Sewell Field at Byron P. Hollett Little Giant Stadium. While many Wabash purists first balked at the idea of a synthetic playing surface, the Field Turf Pro gridiron matches the excellence of Wabash’s entire athletics program. We’re thankful for the many fond and spirited memories we have of games played in that stadium and the men who compete as Little Giants, and for the benefactors who make that competition possible. By month’s end, it was time for Homecoming. It’s hard to put an accurate number on it, but I suspect that about 6,000 people returned to alma mater to reminisce, remember, and celebrate Wabash’s thrilling 31-14 win over the University of Chicago. At the Homecoming Alumni Chapel, two special friends were among those honored by the National Association of Wabash Men. The College’s alumni director and Crawfordsville native, Tom Runge, received the Alumni Award of Merit, and long-time swimming and diving coach, Gail Pebworth, was named an honorary alumna in the Class of 1991. We’re thankful to both for their service to and love of Wabash College. In late October, the Wabash community gathered again to celebrate the College’s tradition of philanthropy. At an exciting event on the last Friday of the month, alumni, faculty, staff, students, and friends gathered to announce the five-year, $60 million Challenge of Excellence capital campaign. We are thankful to those people — especially the College’s Trustees — who already have given or pledged nearly $36 million toward that goal. A week later, a record number of high school seniors and their family members descended on Wabash for the Top Ten Scholarship Visit Day. Well over 180 young men who rank in the top ten percent of their high school graduating classes made their way to campus to learn more about Wabash and to meet with alumni, faculty, and students. We are thankful that Wabash’s reputation is strong, that high school students aspire to become Wabash men, and that our accomplished alumni are living proof of the value of a liberal arts education. On the eve of the Monon Bell Classic, scores of alumni and family members came back to Wabash for the Athletics Hall of Fame induction ceremony. A remarkable class of nine men representing eight different varsity sports were inducted (with another soon to follow). We’re thankful for Wabash’s rich tradition of intercollegiate athletics and that the College honors its sports heroes. Throughout the fall, students and visiting artists entertained us with their musical and theatrical performances on stage. We are thankful for the diversity of talents in this small community, and for the College’s commitment to the education of the whole person. And that brings us to Saturday, November 13. No other colleges in the country can boast of a rivalry as old, as fierce, and as storied as the Monon Bell rivalry between Wabash and DePauw. We may take it for granted that a single, small college football game means so much to so many people, near and far. In reality, there really isn’t anything like it in all of college sports. In a season of Thanksgiving, we at Wabash are blessed. We are blessed with a caring, dedicated faculty and staff, eager students, loyal alumni, and a community that embraces this liberal arts college for men. For all of these reasons and more, we are thankful. Jim Amidon — Barely six minutes of football had been played in Saturday’s 117th Monon Bell Classic when Wabash Coach Erik Raeburn trotted his senior kicker, Spencer Whitehead, out to the field to attempt a 43-yard-field goal in a drizzling, windy rainstorm at Byron P. Hollett Little Giant Stadium. Wabash and DePauw had traded punches on the first three drives of the game, but on their second series, the Little Giants had reached the edge of Whitehead’s field goal range. In games earlier in the season, Coach Raeburn might have elected to go for it on fourth down and four, but in the Monon Bell Game — even in rotten weather conditions — Raeburn elected to try to get the game’s first points on the scoreboard. 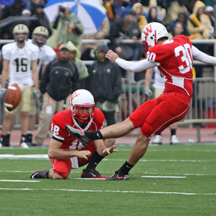 Senior Kyle Grand made a perfect snap to senior holder Josh Miracle. Whitehead strode into the kick and booted the football through the west goal posts and Wabash had taken a 3-0 lead against the undefeated, 9-0 Tigers. At the time — with 54 minutes of football remaining and weather conditions deteriorating — the three points seemed trivial at best. DePauw’s high-powered offense averaged 33 points per game through the season. It seemed simply unfathomable that Whitehead’s kick would be the only points the Little Giants would need to knock off the Tigers, retain the Monon Bell for the second straight year, and finish the injury-plagued season 8-2. And yet, those three points were all the Little Giant defenders needed. They blitzed, chased, and rattled DePauw’s talented senior quarterback, Michael Engle, who was forced to throw off his back foot time and time again. Senior linemen Nick Ramsey, J.D. McClintic, Zach Brock, and Jake Kolisek, along with senior linebackers Dan Ryan Wood, C.J. Gum, and Deonte Singfield, eliminated DePauw’s running game — entirely. By early in the third quarter, every Wabash senior had made it clear that the only piece of unfinished business was the final score. There are myriad clichés about the Monon Bell Classic — throw out the records, anything can happen, unsung heroes rise up. But few in the record-sized crowd of over 11,500 hearty fans could have predicted a blowout of such large proportions. 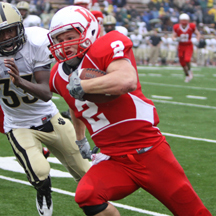 Wabash dominated in every phase of the game, including coaching, en route to the third largest scoring margin in the 117-year history of the rivalry. Few would have predicted that senior running back Derrick Yoder would save the best game of his Wabash career for the Bell Game. Yoder had been knocked around for being too small and not durable enough, but nobody in the stadium played any bigger than he did — lowering his shoulder time and again for extra yards. Yoder’s 164 yards rushing were nearly twice the total offense generated by the entire DePauw team. There wasn’t a soul in the stadium who would have bet that DePauw’s All-American receiver, Alex Koors, would go without a catch in the first half and be a non-factor in the game. DePauw never advanced the ball inside Wabash’s 20 yard-line. Nobody would have guessed that Raeburn’s decision to go with the alternating quarterback combo of Chase Belton and Tyler Burke would do anything but blow up in his face. Instead, both Burke and Belton shined brilliantly in a game when the sun never did. Burke galloped 14 yards up the middle and dove into the end zone late in the first quarter for the game’s first touchdown. Shortly before halftime, Belton found senior Geoff Wright wide open for a 23-yard touchdown strike. That made it 19-0 at the half and it had become obvious that Wabash was not letting go of the Monon Bell. The quarterbacks combined to throw for over 200 yards and four touchdowns, and seemed to have DePauw’s defense completely off balance. When Coach Raeburn selected to go for it on fourth-and-14 early in the third quarter, Burke arced a bomb to Brady Young — for the first down and a 36-yard touchdown. DePauw’s hopes for a second-half comeback were dashed when Young walked into the end zone. 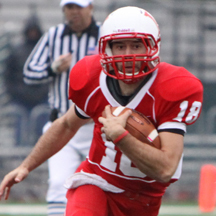 Josh Miracle, Wabash’s gritty, four-year backup quarterback, engineered the offense for most of the fourth quarter. He and fellow senior Tommy Mambourg each rushed for 39 yards in the game’s final minutes, allowing them a satisfying end to their careers. It has been decades since either Wabash or DePauw enjoyed such a one-sided victory, which is even more unusual since both teams appeared so evenly matched on paper. The credit goes to Wabash’s seniors and coaches, who were denied the Bell in 2007 and 2008. The senior captains said in Chapel on Thursday that the Bell would stay in Crawfordsville, and on Saturday they made good on that promise by turning in the most dominating performance in modern Monon Bell history. 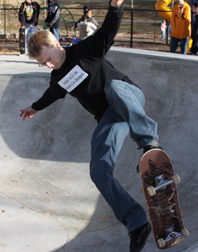 Jim Amidon — Saturday’s dedication of the Milligan Skatepark was a triumph on every level. As hundreds gathered to watch a small committee of dedicated citizens cut a ceremonial red ribbon to open the park, the sun rose above a large bank of trees on the southern edge of Milligan Park. The entire 8,000-foot concrete skatepark was bathed in late-morning sunshine. It seemed like a very, very long time ago when a city ordinance drove skateboarders out of downtown, off the sidewalks, and away from parking lots. It seemed like a very, very long time ago when Karen Cushman, Sheridan and David Hadley, and a handful of people organized and sent out a mailer asking the community to support a park that would be dedicated to skateboarders, inline skaters, and BMX bikers. Those good people chose not to turn their backs on the kids with funny t-shirts and baggy jeans, and instead decided to work with them to imagine a place where they could fit in, where they could have fun, where they could be themselves. And still, only a few people thought it would be possible to raise nearly one-quarter of a million dollars to plan and build the park… without using public money at any level. Meanwhile, the kids who used to skate down near the courthouse grew older, moved away, tossed out their Vans board shoes. A few hung on to the dream and worked with the committee to design, refine, and create the plans they hoped might someday become reality. A young Wabash math professor — in his first year at the College — joined the committee. Turns out that Chad Westphal was one of those same kids with the funny shoes and baggy jeans. Turns out Chad Westphal — even after completing his Ph.D. in mathematics — still is one of those same kids who gets thrills out of gliding over smooth concrete, up embankments, and sometimes crashing in spectacular fashion. The skatepark became Westphal’s passion. Suddenly the committee had an adult member with skateboarding on the brain — and a vision for a park that was attainable. Money began to come in — slowly — from private donors, Kiwanis, Youth Services Bureau, and the Montgomery County Community Foundation, among many others. By last summer, it became clear that a skatepark would finally be built in Milligan Park. So, at a little after 11 a.m. on Saturday morning, Mike Scime stood on a concrete embankment wearing a jet black t-shirt that read, “I helped build the Crawfordsville Skatepark.” As at least 100 kids with skateboards, bikes, rollerblades, and even razor scooters watched, Scime thanked the volunteers, donors, and foundations who saw the project through, start to finish. Then he looked down at the kids and thanked them for their patience and inspiration. Moments later, Scime, Sheridan Hadley, Cheryl Keim, Westphal, and Karen Cushman stood behind the red ribbon. They handed the scissors to a skater named Trevor Metcalf to have the honor of officially dedicating the park. It was the committee’s desire to have one of the kids who inspired the work open the park to the public. And for Metcalf, the moment was especially sweet. 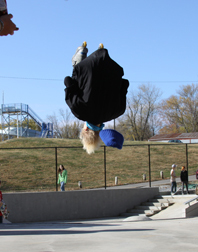 He and his family moved to Michigan not long ago, but they woke at 3 a.m. on Saturday to make the drive so that he could be in Crawfordsville when the Milligan Skatepark was finally opened. You could say that Trevor was “head over heels” with excitement. After Westphal declared the park officially open, the bowls, tubes, stairs, flat-tops, and rails were flooded with kids from probably five years old to 25 (plus Westphal). Metcalf strapped on his inline roller blades and took off. Starting at the north end of the park, he got up a head of speed, and took off toward the “Westphal Tube.” As he gained full speed, a wide smile crept across his face. He started up the steep embankment on the south edge of the tube, shot up like a rocket, tucked his legs under his body, and completed a full revolution before landing with a thud and a thump hard on the concrete edge. It was a hard fall; the kind of fall that made this 45-year-old reach for his cell phone to call 911. But Metcalf was fine. In fact, he was laughing as he spread across the freezing concrete. He had gotten through the full revolution in the air and he had landed on both blades, slamming hard on his rear end. With his friends and fellow skaters surrounding him, he jumped to his feet (blades) and shouted, “I’ve got this” as he headed back to the other side to try the trick one more time.